A new project of Russia's prominent anti-corruption activist Alexei Navalny, RosVybory, aims at monitoring the upcoming presidential elections. But will it be successful like Navalny's previous project Rospil? Anti-corruption crusader Alexei Navalny has taken his lawyer’s know-how to the polls, launching his latest project, RosVybory, to recruit monitors for the March 4 presidential election. After the success of his graftfighting RosPil, the new project will deploy election monitors to the most fraud-prone precincts, where violations were registered in the Dec. 4 parliamentary elections and where the ruling United Russia party received a suspiciously high vote. 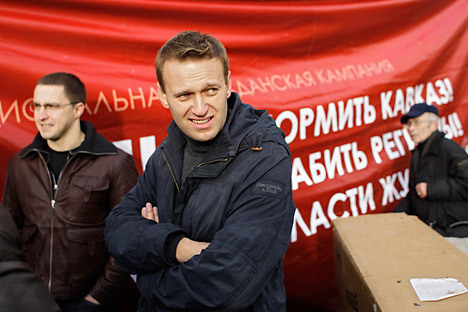 Through RosVybory, Navalny is also recruiting lawyers and creating “mobile brigades” of volunteers to catch “carousel” voting – an illegal method where one person votes at several polling stations using a fake absentee ballot or a candidate’s agent buys a ballot from a voter, ticks his candidate and gives it to another voter to cast it in the ballot box in exchange for his ballot. Since the law allows only candidates, parliamentary parties and the mass media to send monitors to precincts, Navalny is negotiating the participation of RosVybory volunteers with Communists, Just Russia, as well as independent candidates where municipal elections will be held alongside the presidential vote. As of Wednesday night, 5,000 volunteers registered on the project’s website and 1,500 of them are from Moscow, RosVybory coordinator Georgy Alburov told The Moscow News. There are 97,000 precincts in Russia, 3,300 of which are in Moscow. Alexander Lebedev, the manager of Just Russia’s Election Day project in Moscow, plans to deploy at least three monitors to each precinct. Monitors undergo special training and go to lectures. “The main aim of our training is to explain to monitors how to prevent a violation, not how to kick up a fuss and write a complaint – they are useless in our system,” Lebedev said. Monitors are also taught to use cameras in order to record violations. Lebedev, however, does not believe that to be an effective way to challenge vote results. Only media representatives have the right to film at polling stations. In its separate instruction for the Dec. 4 elections, however, the Central Elections Commission allowed monitors to film as long as it was not with hidden cameras. The number of monitors joining Just Russia may increase, given that the Central Elections Commission barred Yabloko party leader Grigory Yavlinsky from the election, citing forgeries among the 2 million signatures he had to collect to apply for registration. Barring Yavlinsky leaves Prime Minister Vladimir Putin, Just Russia’s Sergei Mironov, LDPR’s Vladimir Zhirinovsky, the Communists’ Gennady Zyuganov and billionaire Mikhail Prokhorov in the race. “The only reason why Yavlinsky is being withdrawn from the race is the need to get rid of Yabloko monitors,” popular LiveJournal blogger Andrei Malgin wrote. Yabloko may still be able to send its monitors to precincts as representatives of its publication, Yabloko Rossii, party spokesman Igor Yakovlev told The Moscow News. But Yabloko’s chances of monitoring the elections are still limited. “Even though the statuses of monitors and of representatives of the mass media are very similar, in real life the latter are more often kicked out from polling stations,” Yakovlev said. Navalny’s RosVybory is still counting on Yabloko. It will also cooperate with the independent Golos vote monitoring association. “They share their training materials with us, they’re a great help,” Georgy Alburov said. Golos executive director Lilia Shibanova told The Moscow News that her association will also hold training sessions for RosVybory monitors. Alburov said his group has scheduled video training and will hold lectures and meetings with experts. But pressure was mounting on the organization. On Tuesday, Golos was notified that its Moscow office would have its power cut off from January 25 through March 6, due to repairs. Last Monday its landlord, the Literaturnaya Gazeta publishing house, said on February 1 it would revoke the organization’s lease, previously due to expire in August. Shibanova told The Moscow News on Thursday that following a media campaign in defense of Golos, the landlord promised to review its decision and let the organization stay in its offices until February 24. Shibanova added that they have seen no power cuts so far.